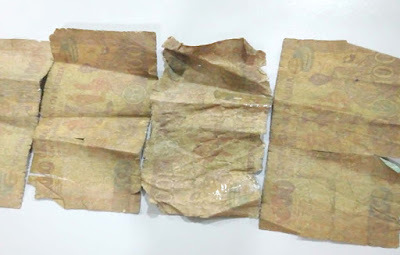 A disagreement be tween a commer cial motorcyclist and his passenger over a dirty Naira note, yesterday, turned bloody in Lagos as irate youth beat the cyclist to coma. A correspondent of the News Agency of Nigeria (NAN), who witnessed the incident, reported that the cyclist, identified as Okon Akpan, had conveyed the passenger, identified as Titilope Fatai, from Okoko-maiko to Iyana-Iba market for a fee of N200. Trouble started when Fatai gave the cyclist N500 and when Akpan gave his passenger her N300 balance, made up of N200 and N100 notes, the lady returned the N100 and requested for replacement on the grounds that it was “too dirty”. A heated argument ensued as the cyclist insisted he did not have a neater note to replace the ‘smelling’ one as demanded by his passenger. As Akpan tried to leave without reaching an accord, the lady slapped him and he, in return, started beating her. Unknown to the cyclist, the lady was popular among street unchains around, who reacted by beating him to unconsciousness. His fellow commercial motorcyclists took him to an undisclosed hospital.